I never idolized professional wrestlers like I did other athletes. Even when I was young, I realized that the muscled behemoths were all just characters as found in a movie or TV show. We didn’t really know these guys. For all anyone could tell, the monster heels could be the nicest guys in the world, while the babyfaces were the ones refusing to sign autographs for kids. The difference between actors and wrestlers is that in the case of the former, we appreciate that character and actor are not one of the same. Anthony Hopkins may be Hannibal Lecter, but he’s also that amiable British dude who was on Letterman last night. The stars of the squared circle generally keep the act up in public, dating back to the days when fans actually believed all the wild things that went down in the scripted world of pro rasslin’ were real. Terry Bollea was Hulk Hogan in the ring just as he was at the supermarket. When the line between a wrestler and his persona get blurred to the point that they themselves can’t even differentiate one from the other, it’s called living the gimmick. That’s a reason why many don’t take wrestlers seriously, or give them the respect they would thespians. Which brings us to the Ultimate Warrior. I loved the Ultimate Warrior. With apologies to Bret Hart, he was my favourite wrestler as a kid. What 10-year-old didn’t love the tassel-wearing grappler with the war paint who cut promos straight out of Saturday morning cartoons and then charged madly to the ring where he effectively dispatched of bad guys in the most spectacular fashion? I didn’t know James Hellwig, the man who brought this superhero to live each night. When the internet arrived and exposed wrestling for both its genius and ugliness, there were stories of this aloof guy so blinded by his gimmick that he had become virtually unemployable by the WWF. By the time he legally changed his name to Warrior, just about everybody in the world figured the former Mr. Hellwig to be an absolute kook, maybe even crazier than character of the Ultimate Warrior. Flash forward about a decade and a half, and I’m (supposedly) an adult with a (self-fancied) educated view on the art of the squared circle. But I’m also a sentimentalist, so even though I’d long since accepted that Warrior, the man, had completely gone off crazy cliff, I was over the moon when it was announced that the Ultimate Warrior, the beloved character from my childhood, would be inducted into the WWE Hall of Fame this year. It was this long overdue enshrinement that I was most anticipating on WrestleMania weekend. Not Undertaker/Lesnar, not HHH/Daniel Bryan, not the triple-threat title match. What I wanted to hear, more than anything, was the speech from a famously outspoken personality whose legendary promos were as epic as they were nonsensical. And it was then that we finally got to meet, understand, and appreciate the man behind the mask. He spoke of how hurt he was when WWE released the infamous “Self Destruction of the Ultimate Warrior” DVD that basically took his legacy, drug it through the mud six or seven times, then backed over it with a semi-truck and flushed the remains down the toilet. He discussed how each generation of wrestlers needed to open the door for the next. He expressed appreciation for the staff behind the scenes and virtually demanded WWE add a Hall of Fame category for such unheralded individuals, even naming one particular individual the honour should be named for. He addressed the living the gimmick issue. There were shots of his wife of many years tearing up. He was escorted to the podium by his two young daughters, whom he clearly adored just as they did him. He was funny, entertaining, and not entirely above firing off the occasional shot. But he spoke with amazing passion, candour, gravity, and most significantly and surprisingly, self-awareness that we never believed he possessed. This was not a caricature. This was a man. A human made of flesh and blood who felt emotions like any other. His speech went on for a long time, though it could have gone on forever as far as I was concerned. But he was already on borrowed time. Two nights later on Raw, he demonstrated once and for all that Warrior and the Ultimate Warrior were not one in the same. Addressing fans from the ring he had not graced since 1996, he spoke of his incredible appreciation. Then he put on the mask, and cut another classic Warrior promo. Warrior died Tuesday night. A shocking turn rendered even moreso by the timing. Had he passed away even a week earlier, we would not have got to know the man behind the mask. Many of Warrior’s peers have since talked about how he did not look well at WrestleMania weekend. It’s almost as if he survived just long enough to make good, to right the wrongs, to clear the air, to bury the hatchet, to show his love and appreciation. 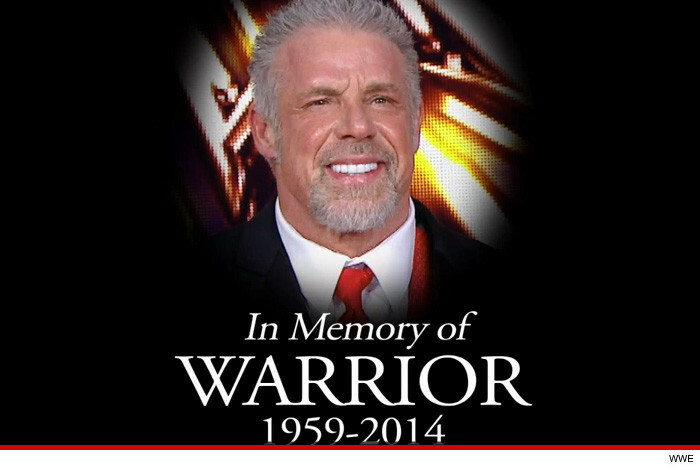 When I heard the news Wednesday morning, I wasn’t saddened so much for losing the Ultimate Warrior as I was for the daughters who will grow up without a father. A father that just so happened to play one of the greatest figures in wrestling history. I’m thankful we got to see him one last time. Now I will not just forever be a fan of the gimmick, but appreciate and respect the man behind it.